I have always been curious about magic and witchcraft, but after visiting a mystical store in Solvang, California and meeting my first true witch, I was hooked. 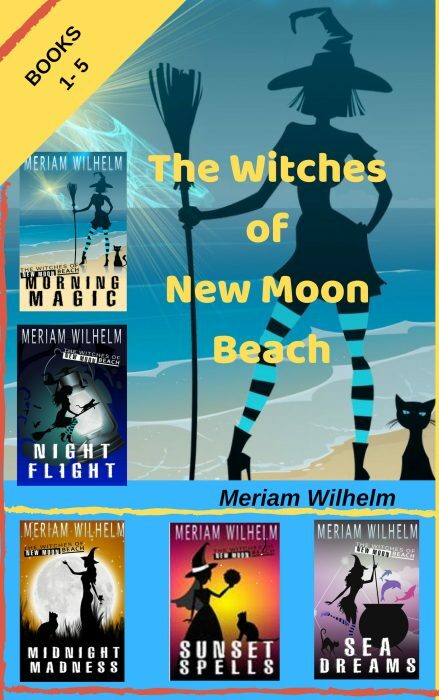 One book quickly became five as I created and grew to love the city of New Moon Beach, introducing readers to a family of three magically gifted sister witches who are always finding themselves in some kind of trouble. My characters are modeled after friends and colleagues, as well as some of the witches and other interesting people I've come to know over the past years. I love to collect unique or impressive names as I travel and try to use at least one in each of my books. Family is important to me and I have three sisters, so it seemed only natural to create a family of sister witches in each book. My head began to slowly spin and for a moment I felt as if I was going to faint as tiny blue lights flashed before my eyes and the sound of soft rain filled the room. The unexpected scent of Jasmine, the flower of motherhood, floated all around me – clinging to my clothing, my hair, my heart. I fell to my knees in a confused state. What was happening? What had I done? And then, a sense of calm quickly wrapped around me like a warm blanket, replacing any fear I’d previously felt. As I watched, a door of sorts appeared to magically open before me and the image of a beautiful woman in a long white dress floated into sight. She seemed to know me and smiled a welcoming smile that I felt all the way to my soul.